Heinz Bär Luftwaffe Top Gun! Heinz Bär flying his personal Me 262 preparing to attack 9th AF B-26 bombers. "Springtime for Hitler and Germany" Troy White © 2008 Oil on Canvas 36" x 24" For Sale. Oberstleutnant Heinz Bär is considered by many to be the Luftwaffe's greatest ace of WWII. Bär was a fighter pilot in the Luftwaffe at the start of the war and flew over 1,000 missions between September 1, 1939 and May 8, 1945. He flew on all fronts and against every type of allied aircraft and by war's end had amassed at least 220 victories. He was second only to Hans-Joachim Marseille in shooting down Brits and Yanks with 124 victories in the west. Bär also shot down 21 four engine bombers and in 1945 scored 16 victories while flying the Me 262 Jet fighter making him the top scoring day pilot in that type. During the course of the war he was shot down 18 times with 14 forced landings and four parachute jumps. Heinz was born on May 25, 1913 in Sommerfeld near Leipzig. His father was a farmer and Heinz grew up with a love of the outdoors. In the 1920's he became interested in flight and learned to fly gliders graduating to powered aircraft which he first flew in 1930. He joined the Luftwaffe in 1937 in order to build hours and then become an airline pilot. At the start of WWII Bär was a Unteroffizer flying Me 109's with 1./JG 51. He scored his first victory of a French P-36 on September 25, 1939. He participated in the Battle of France and the Battle of Britain. On September 2, 1940 he was nursing his damaged Me 109 back to France when a Spitfire finished him off. He bailed out into the English Channel and after swimming for two hours reached a buoy which he clung to until picked up by a German patrol boat later that evening. With the invasion of Russia in 1941 Heinz deployed to that arena with JG 51 and in two months time his score stood at 60. He was awarded the Knight's Cross in July and the Oak Leaves in August. On June 30th he shot down five Russians and on August 30th he shot down six. 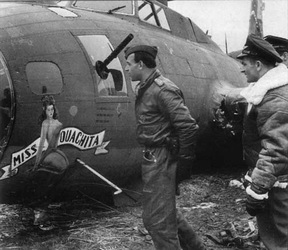 The next day he was shot down behind enemy lines and was forced to bail out in high winds. He was punished on landed and then was dragged on the ground for a football field or two before he managed to collapse his parachute. Though he had fractured his spine he evaded capture for two days before making back to German lines. His injuries were so severe that he required an extended stay in hospital. After recovering, he returned to JG 51 and by February 1942 he had 90 victories and had been awarded the Swords to his Knight's Cross. With the war heating up in the Mediterranean Bär was transferred to Sicily and given command of JG 77 where he racked up 45 more victories before being assigned back to Germany to help battle the American heavy bomber threat. January 1944 found him in command of II./ JG 1 and on April 22nd he knocked down a B-24 Liberator to claim his 200th victory. By the time the Allies invaded Normandy in June of 1944 Bär was in command of JG 3 "Udet". He led that unit for the rest of the year. On December 24, 1944 led JG 3 in an attack on American B-17 Flying Fortresses. 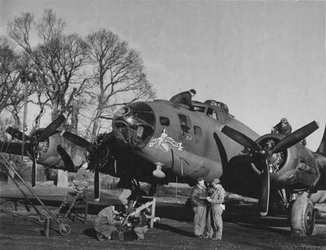 Four of the heavy bombers were shot down. Among the American fliers killed in the battle was General Fredrick Castle who remained at the controls so that his crew could bail. Operation Bodenplatte, the German attack on Allied airfields on the continent was a fiasco for most Luftwaffe units. JG 3 however, under the leadership of Bär was an exception. Their target was Eindhoven and the RAF and RCAF Spitfire and Typhoon squadrons based there. They wiped out a complete squadron of Typhoons and a large number of Spitfires with Bär notching up victories 203 and 204. Next Heinz was given command of III./ EG 2 in Lechfeld. 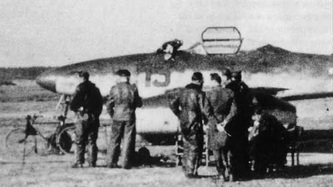 III./ EG 2 was an operational training unit for the new Me 262 jet fighter. Now he was flying the fastest and best fighter of the war in a target rich environment. Between January and the end of the war in May he scored 16 victories. On April 27th he was given command of the famed "Squadron of Experts" JV 44. The very next day he scored his last victory of WWII when he dispatched an American P-47 Thunderbolt. 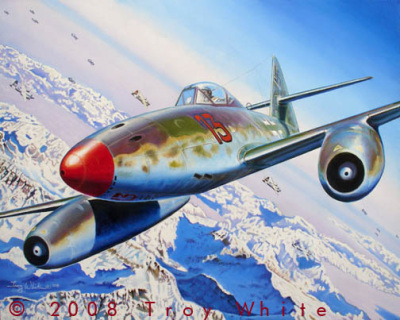 "Springtime for Hitler and Germany" depicts Heinz flying his personal Me 262 which he flew with III./ EG 2. 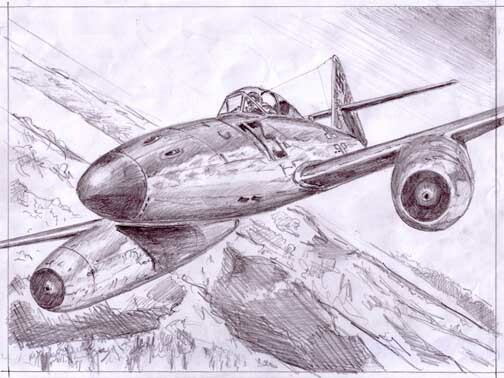 With the fall of Germany Heinz Bär was whisked away by the Americans so that he might impart his knowledge of the Me 262 to them. Returning to Germany, he found it difficult to find employment but in 1950 secured a job in aviation. He was killed in the crash of a light plane on April 28, 1957.